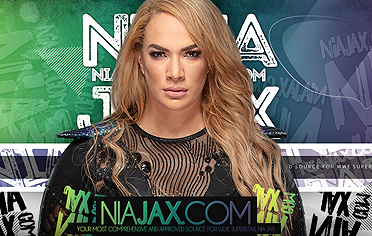 Nia Jax’s 2018 Highlight from NiaJaxCom on Vimeo. 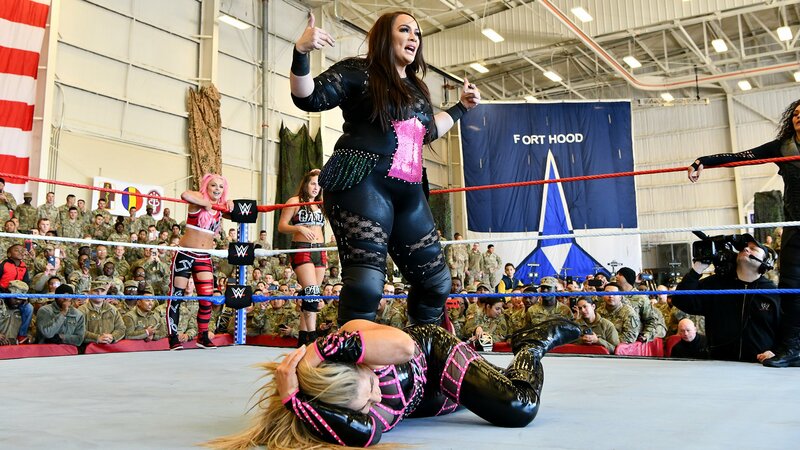 Tamina uses her size to take down Natalya. She misses a corner splash, Natalya rolls her up for a two count. Jax tags in andher and Tamina run through Natalya with a shoulder block. Nia works Natalya down with a big running elbow drop. Tamina comes back in and targets Natalya’s body. Natalya cradles Tamina, but Tamina escapes with ease. Corner splash from Tamina. Second one misses, and Sarah Logan tags back in. Logan taunts Rousey before locking in a cobra-clutch on Natalya. Natalya breaks the hold but Logan cuts her off with a running dropkick. Pinfall attempt but Natalya escapes. She finally breaks off and tags in Rousey. Rousey runs over Logan with lariats, judo-throws, and right hands. Tamina runs in but Rousey takes care of her. Natalya takes out Tamina with a discus clothesline. 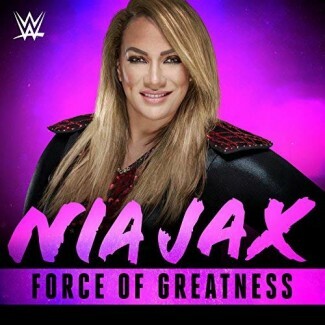 Nia comes in to take out Natalya but is forced into the ring post. 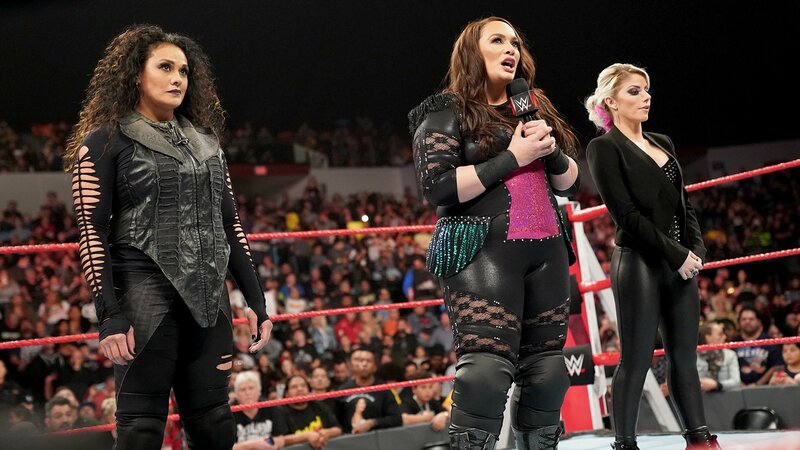 Riott Squad goes after Rousey, but Rousey grabs them both and tosses them over. She sets up for a double-armbar and locks it in. They both tap for the win. 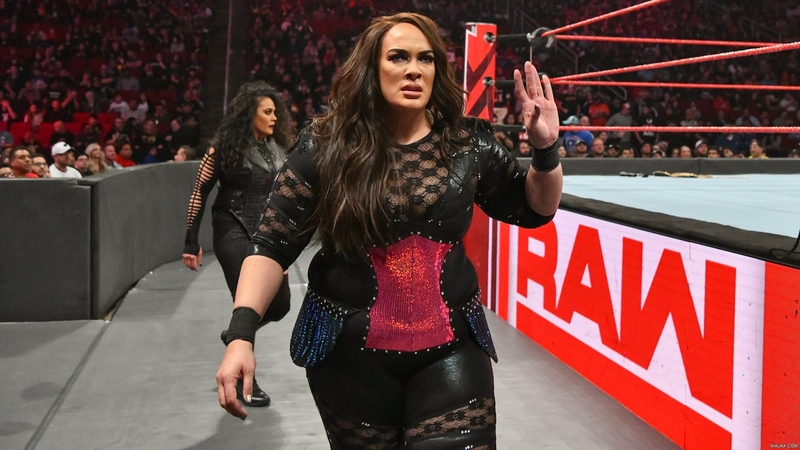 We go to the ring and out first comes Nia Jax with Tamina Snuka. RAW Women’s Champion Ronda Rousey is out next. We get formal ring introductions of both opponents. The bell rings and they lock up. Jax powers up and tosses Rousey back into the corner by her neck. Rousey with some jabs and a smile. Rousey bounces around and ducks a charge. Jax catches Rousey and sends her into the corner. Rousey comes out with kicks. Rousey brings Jax down with a knee but Jax catches her. Jax threatens Rousey with the right hand but Rousey rolls her into an arm submission. Rousey turns that but Jax powers up with a sitdown powerbomb for a 2 count. Jax launches Rousey across the ring and splashes her in the corner. Jax sends Rousey back to the mat and drops an elbow for a quick 1 count. Jax slaps Rousey around and takes her time. Jax sends Rousey into the corner now, hitting her shoulder on the ring post. Fans boo as Jax stands tall. Jax charges in the corner and sends the shoulder into the ring post. Jax keeps control and goes for the leg drop but Rousey moves out of the way. Rousey jumps up and tries to bring Jax down with a submission but Jax overpowers. Rousey counters and jumps on Jax’s back with a Sleeper attempt. They tangle to the mat and end up going to the floor as Jax launches Rousey into the barrier to finally get some separation. Snuka applauds Jax. Jax brings Rousey back into the ring and covers for a 2 count. Jax keeps Rousey grounded in the middle of the ring now. Rousey fights up but Jax stops her with a kick. Rousey counters a powerbomb attempt and sends Jax across the ring. Jax goes shoulder-first into the corner and falls out to the floor. Rousey goes to the top and nails a crossbody on the floor. Rousey brings it back into the ring for a 2 count. Rousey bounces around and looks to put Jax away. Rousey ends up connecting with a big step-up right hand for a close 2 count. Rousey goes back up for another crossbody but Jax rolls through and powers up with a big Samoan Drop. Rousey still kicks out at 2, just in time. Jax can’t believe it. Jax keeps control and sends Rousey into the corner for a splash. Jax scoops Rousey on her shoulders, taking her to the second rope for a super Samoan Drop. Rousey with elbows to the face while she’s up high. Rousey slides out and goes for the powerbomb from the second rope. She hits it but Jax still kicks out at 2. Rousey goes over and tries for the armbar but Jax resists. Snuka gets on the apron and Rousey reaches but Jax attacks from behind. Jax misses her big right hand. Rousey climbs Jax’s body and brings her down into the armbar. Jax continues to resist the hold. Rousey turns to Snuka to taunt her while tightening the armbar on Jax. Rousey kisses Jax’s fist and drops into the armbar causing Jax taps out. We go to the ring and out comes Alexa Bliss, then Nia Jax and Tamina Snuka. Jax takes shots at Ronda Rousey to start the segment. Jax goes on and looks at her right hand and talks about how she put SmackDown Women’s Champion Becky Lynch down with it. 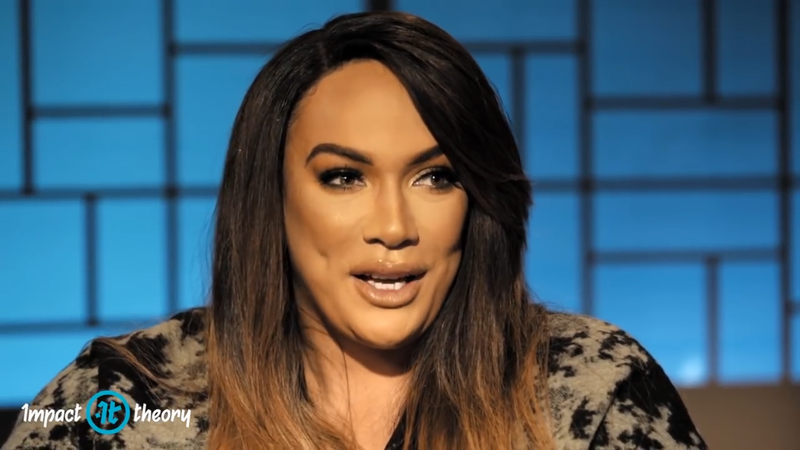 She says she will do the same thing with Rousey on Sunday at TLC but she won’t stop with just one punch. Jax goes on about how she’s a strategist and how she will still defeat Rousey on Sunday if she blocks the punch. Jax screams out that the Women’s Championship is her. The music interrupts and out comes Rousey. Rousey says she didn’t come out here to hit her poses and talk about fighting. She came to fight. Rousey rushes the ring as Jax and Snuka retreat to the floor. They regroup and hit the apron to stare Rousey down. Ember Moon’s music hits next and she runs down to join Rousey in the ring. Jax and Snuka go back to the floor. After the match, Rousey hits the ring to raise Moon’s arm as the music hits. Jax and Snuka look on from ringside.